There are a number of additional and advanced one day classes, designed for both beginners and those looking to improve their skills and salon practices as a nail technician. The Nail Academy is passionate about helping up-coming Nail Technician’s flourish in the profession through continued high standards of training, coupled with personal support. Angie and the team are both approachable and generous in their teaching and support following any of the courses taken at the Academy. 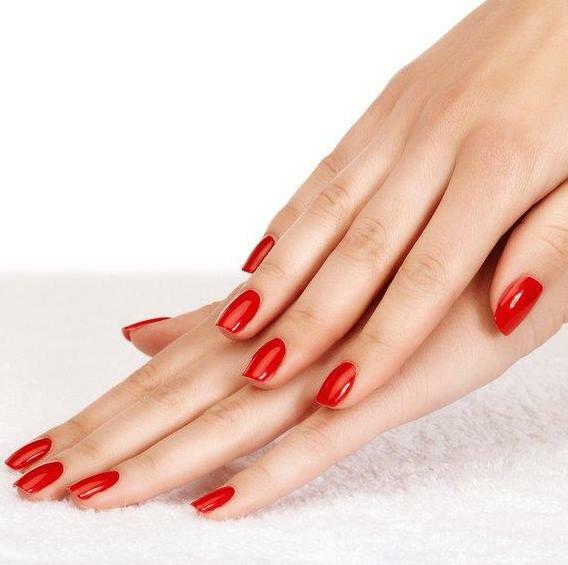 Manicure and Soak Off Gel Polish for Beginners. * Acrylic and UVGel when correctly prepared and applied are hygienic, safe and reliable. Both are equally strong and beautiful. Once qualified in either you may add the other via a one day conversion class. 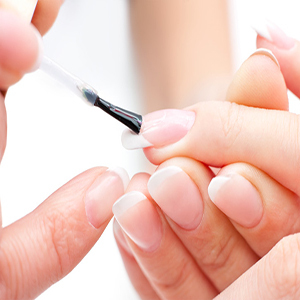 The Nail Academy uses only world renowned, top quality products. Our primary focus is to ensure that you are trained to the highest standard. Contact one of our advisors who can help you choose the best course for you and your future plans. Training in manicure not only gives you a luxury client service option but is also the pre-reqisite for the application of soak off gel lacquers such as Gelish and Shellac. This class requires home study and your notes will be sent to you once your booking is confirmed. In the morning you will be taught all the basics of natural hand and nail care, including hand and arm massage sequences and the full manicure procedure. In the afternoon unlock the secrets of soak off UV Gel Polish. Discover the unlimited colour and style opportunities that will satisfy your clients every wish and increase your profits. UV Gel Polishes delivers 14 day + wear with no chipping or scratching. See and try the newest, incredible nail colour innovation. Experience the ease and unbeatable results of UV3 technology. A certificate on successful completion. Cost – £160.00 – Inclusive one day course. Congratulations on completing your 4 Day Beginners course and taking your first step towards becoming a nail technician. As with all budding professionals, practice and continued education play an important part in sharpening your abilities. This valuable class is strongly recommended as the first course after completing the 4 day foundation programme. Remember, the objective of the day is to help you move forward in your new career. The course will guide you through your early steps into your new business. There is opportunity for discussion, questions and advice. Complete a full set of nails or rebalance a set of yout choice and improve both your standard and time. Cost – £160.00 – One day course. Good quality UV Gel is strong and beautiful with good adhesion qualities. Although hard wearing, UV Gel is slightly “softer” under the file than Acrylic. The only other significant difference between the two systems is that Gel has no odour. With new advancements and a multitude of gel colours to select from, they are an equally popular choice with many clients. A one day course for nail technicians who have qualified previously in either Acrylic or another UV Gel system and who are looking to offer a top quality UV Gel (such as CND Brisa) service to their clientele. Good quality Acrylic is strong and beautiful with good adhesion qualities. You can achieve ultimate clarity without discolouration, extreme strength and have the freedom of artistic design. A one day course for nail technicians who have qualified previously in either UV Gel or another Acrylic system and who are looking to convert to a top quality Acrylic system. One to One training provides the opportunity for any student wishing to focus on improving a particular area of their work. The session is designed to ensure you overcome any issues or resolve any situations that you may not yet be entirely comfortable with. The strength of the one-to-one tuition is that the nail technician spends as much time as needed in whatever field they feel would benefit them the most – either application skills, theory, or a combination of both. (£35 per hour). Cost – £35.00 per hour. This class is designed for nail technicians who have qualified previously in UV Gel or Acrylic. Sculpting enables you to extend the natural nail without the use of a nail tip. This is one of the earliest methods of nail enhancement and enables you to enjoy true artistry. This method has been made more beautiful and versatile thanks to today’s technology and may be used for “everyday” nails, “stiletto” nails or to correct a “hooked” nail. A one day class to learn the versatility of producing sculptured nail extensions, in either gel or acrylic. This class has been specifically designed for the qualified nail technician who is looking to improve their time, knowledge and technique in a rebalance service. By now you will have completed several months as a nail technician and, whilst seeing clients and providing an ongoing rebalance and maintenance service, will have come across a variety of scenarios that you would like to understand more fully and be provided answers to. This course will do just that – an intensive day where we will work with you to resolve any issues that you may be experiencing and ultimately improve your technique further. These classes build on a nail technician’s practical ability, allowing you to work faster and produce better looking nail enhancements. It makes a perfect complement to the Beginners courses and it will allow you to sharpen your abilities. You will learn basic and beautiful nailart design. Nail art is a great way of transforming your clients talons into the hottest fashion accessories. Amazing designs can be achieved by learning to paint flowers and motifs or using transfers and foils. A fun, freehand art class using varnish, nail paints, glitter, crazy colours, transfers, rhinestones, foils and your wildest imagination. £25.00 – Basic nail art product kit. This class requires home study and your notes will be sent to you once your booking is confirmed. Almond Spa Manicure – Escape. Exhale. Relax. A journey cradled in sweet almond & jojoba oils & vitamin E. Bathe. Scrub. Illuminate. Hydrate. Citrus Spa Manicure – Excite. Energise. Refresh. A symphony of essential oils, vitamin E & antioxidants to stimulate the senses. Bathe. Scrub. Illuminate. Hydrate. Earth Spa Pedicure – Escape. Exhale. Relax. Embracing warmth and using vitamins & minerals to protect and fortify. Bathe. Warming Scrub. Masque. Hydrate. Cost – £160.00 – One day course or £85.00 for either half day class. Training in pedicure not only gives you a luxury client service option but is the pre-requesite for the application of gel lacquers such as Gelish and Shellac. You will be taught the basics of natural nail care, including foot and lower leg massage sequences and the full pedicure procedure. 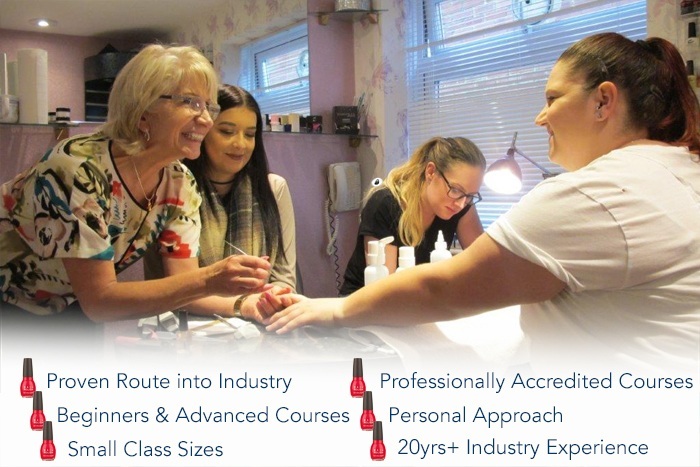 Training in manicure not only gives you a luxury client service option but is also the pre-reqisite for the application of gel lacquers such as Gelish and Shellac. You will be taught all the basics of natural hand and nail care, including hand and arm massage sequences and the full manicure procedure. Unlock the secrets of Gel UV Polish, in this inspirational class. Discover the unlimited colour and style opportunities that will satisfy your clients every wish and increase your profits. UV Gel Polishes delivers 14 day + wear with no chipping or scratching. Combine this service with spa manicure or pedicure with extra ordinary massage techniques for a treatment with a difference. See and try the newest, incredible nail colour innovation. Experience the ease and unbeatable results of UV3 technology. Hundreds of amazing metallics, holograms and designs extend fashion to your fingertips & toes. Worn by many celebrities on the planet. Long lasting and requiring only heat and pressure , this fashionable, long lasting service is a great addition to your service menu and guaranteed to bring in more bookings. Cost – £160.00 – One day course or £85.00 either 1/2 day class.